In New York, Fathers have the same custody rights as Mothers. However, in practice, Fathers often feel that the odds are against them and the courts are biased against them. At the Badanes Law Office we will vigorously fight for your parental rights. We are dedicated to protecting a Father’s rights to be an equal partner in the upbringing of their child. It is often assumed that Mothers always win custody battles. However, the law is clear, a Father has the same rights to obtain custody as a Mother. A court’s decision cannot be based on gender. Instead, the court must consider the “best interests” of the child and apply several factors in its determination. Many Judges recognize that Fathers have the same rights as Mothers. However, it is still extremely important to make sure that you hire an attorney who will zealously fight your rights. The Badanes Law Office is dedicated to protecting Fathers’ Rights and will help you in implementing a game plan in gathering the evidence to help you in your case. • Obtain Full Custody: If you are seeking Full Custody of your child, the Badanes Law Office will vigorously represent you in court to help you obtain your goal. 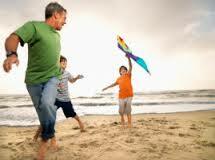 • Shared Parental Time: Many Fathers want a parenting time schedule that gives them 50/50 parenting time. We will present the evidence to achieve your goal. • Creative Parenting Time Schedules: The Badanes Law Office has crafted many creative parenting time schedules so that you have more time with your children. • Child Support Modifications: If your income has decreased, the Badanes Law Office will petition the court to obtain a reduction in your child support obligation. • Child Custody Modifications: If you are seeking a modification to your child custody order or seeking more time with your child, the Badanes Law Office will present the evidence necessary to achieve your goal. Each Father and each situation is unique. The Badanes Law Office seeks solutions that work for you. If you are concerned about your parental rights and your rights as a Father, then the Badanes Law Office can help you to achieve that goal. If you are concerned about your rights as a Father and need more information about Father’s Rights, call Long Island father’s divorce rights attorney David Badanes and the Badanes Law Office. For help with a father’s rights law case, contact the Badanes Law Office today at 631-239-1702, email at david@dbnylaw.com or fill out our convenient contact form online. We have offices in both Northport Village and Garden City, serving clients throughout Nassau and Suffolk County.